At the age of 17, Louise discovered pottery and was hooked. 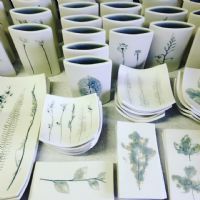 She graduated in 2000 with a BA Hons Degree in 3D Design Ceramics and like many Art graduates, she was forced to join the 9-5 work force but never feeling totally fulfilled. In 2007 she moved to the all-inspiring Connemara region of Ireland to pursue her dreams. Here she has continued to develop her porcelain ranges and is increasingly inspired by the natural environment.